The junction between Dr. E Moses Road and Bapurao Jagtap road has a heavy traffic flow, with traffic converging at the Mahalaxmi Station junction from all three directions, travelling to and from Jacob circle (locally known as saat rasta- 7 roads). The Saat Rasta project is to create 2 underpasses towards Jacob Circle to decongest this traffic. Connecting the missing links between Dr. E Moses Road and Jacob circle via underpasses, the overtly congested Bapurao Jagtap Road is turned into a pedestrian only 1.7 Acres space and the current 8 rasta (8 roads) would become 7 rasta (7 roads) again. All the public and the Institutional buildings that are currently here will be the main beneficiaries of this proposal as connectivity is provided between mass transit modes –Jacob Circle (Monorail) and Mahalaxmi Station (Western Railways). 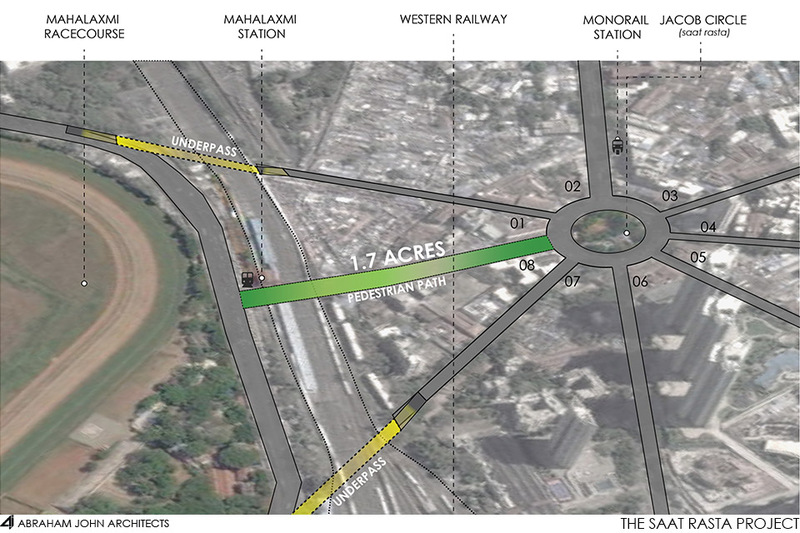 This pedestrian path intersects with the Proposed Greenway at the Mahalaxmi station junction. The next phase of this project will be to connect these two proposals and making a much larger public space.